The plant in picture is Luculia gratissima – an excellent bloomer and ornamental shrub from south Asia particularly from the Himalayas. 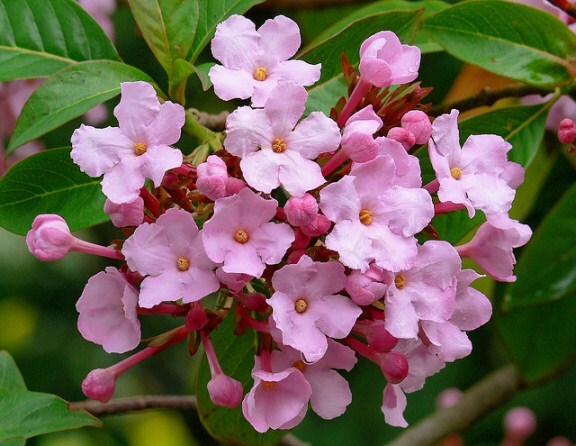 Luculia gratissima belongs to the family of popular flowering shrubs and trees including Ixora, Gardenia and Hamelia. It is an evergreen shrub or small tree (up to 5 meters) that bears beautiful glossy leaves and produces abundance of fragrant flower in fall and winter. The masses of pink flowers spread delightful and jasmine-like scent. Luculia gratissima is a bit difficult to grow in garden in garden as it thrives in a very limited spectrum of day and night temperature (between 28 to 80 F). It also requires long exposure to indirect sunlight, higher level of moisture and well-drained soil. Though a bit difficult to grow, Luculia gratissima is a very rewarding plant that produces long lasting and fragrant winter flowering. It is usually propagated from seeds or hardwood cuttings. Other popular species include: Luculia grandiflora and L. intermedia.